The long wait for Texture FX3® is over! 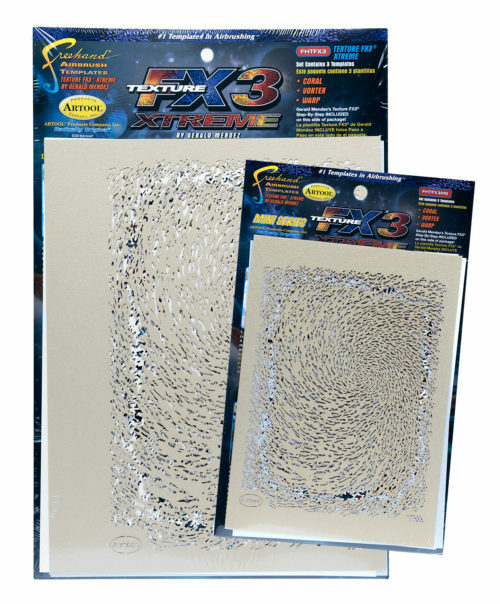 Artool & Anest Iwata, Inc., Portland, Oregon, are proud to announce the release and availability of the new Artool Texture FX3® Xtreme Freehand® Airbrush Templates designed by Gerald Mendez (FH TFX3 & FH TFX3MS). Offered in 3-template sets in our regular & mini-series sizes: Vortex FX, Coral FX & Xtreme FX, Texture FX3® Xtreme Templates provide infinite possibilities for creating amazing natural and organic textural elements in your artwork. BONUS: After each Texture FX3® template is released when tabs are cut, all surrounding spaces now have extended textural edges to perform as additional templates for creating even more effects. Plus, each set comes with a step-by-step instructional guide by Gerald Mendez, where he shares many of his secrets for easily achieving sensational textures every time!